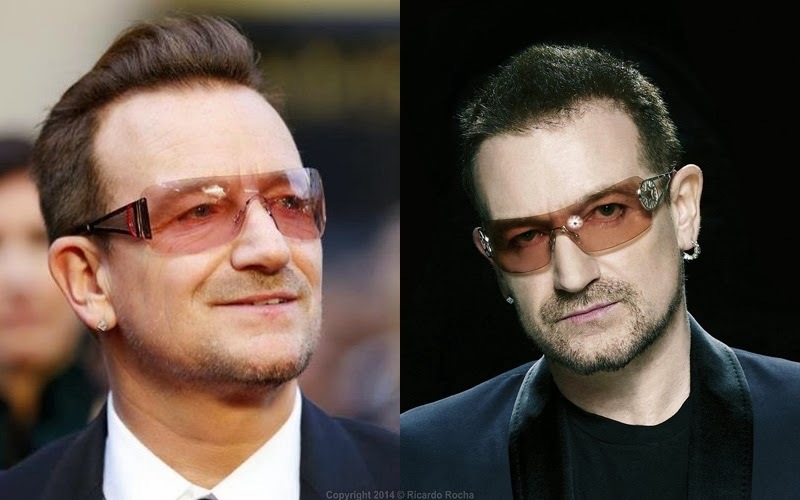 To be used for the discussion of Bono's shades, pics of ones you think match up and where to find 'em if you have a source. The red band does seem to give some foreshadowing as to them being linked to (RED)..and therefore Emporio Armani..or is that a foregone conclusion? I don't know if Bono's EA-(RED) partnership is still 100% in force..I mean, in the Invisible video he is clearly not wearing EA, and that video was for (RED)...could Bvlgari be getting in on the action too? I just don't recall EA having shades with those types of arms. Very Bvlgari. I don't know if that can be known yet. I would assume its just whatever pair he's wearing at the time, really.. Ever seen EA with arms like that? Anyone else get a pair of Marc Jacobs 227 yet? I got a pair this weekend and I'm not sure it's the same model as the Invisible video. The lenses seem smaller on the 227's when comparing to the video. The bar above the nose is slightly bent where as in the video it looks straight. Also, the space between the nose bar and the top bar (I don't know the technical terms) looks to be wider in the video. Just wondering if anyone else had any thoughts? Yes I got my 227s this past weekend. I believe they are the same model, personally. There are different sizings available, though, so I would check that. And, of course of any shades aviators really accentuate the differences in facial width, in my opinion. These shades look really good, but they are just not my style. I'm considering selling them. I've offered them to one person here privately first and if he isn't interested I'll post up the deets. Thanks for the feedback regarding the 227's. That's why I ask the experts. I did look for various sizes but the Marc Jacobs website only has OS which I assumed was 'one size'. All the listings I have seen had the size at 57 only. Anyone know where I can find a pair of Ray Ban 8307 color 001?